Montgomery County in Maryland is not exactly a hotbed of free market thinking or a bastion of limited government. It’s one of the richest counties in the nation, but not because of entrepreneurship and wealth creation. Instead, it’s a bedroom community for over-paid bureaucrats, corrupt lobbyists, fat-cat contractors, and other ne’er-do-wells who commute into Washington and live off the blood, sweat, and tears of people in the economy’s productive sector. To give you an idea of its political leanings, Obama won 72 percent of the vote in Montgomery County in 2008 and all nine members of the County Council are Democrats. So you wouldn’t think this is a place where lawmakers ever have anything sensible to say about tax policy. But, lo and behold, one Councilman recognizes that there’s no Berlin Wall surrounding the County. As such, higher tax rates may not generated additional tax revenue if people vote with their feet. You can listen to George Leventhal by clicking here, but here’s the relevant quote. We may be reaching a tipping point with tax rates. There’s a point beyond which you can keep raising the tax rates, but you won’t get more revenue because if people leave the county or if new businesses don’t start you’re not getting new revenue. For the uninitiated, Leventhal is talking about…gasp…the Laffer Curve. Folks like Paul Krugman would like you to believe that the Laffer Curve is a twisted fantasy concocted by stooges for the rich. He writes that it is “junk economics” to consider the relationship between tax rates, taxable income, and tax revenue. In the real world, though, at least some left-leaning lawmakers realize that higher tax rates backfire if the geese that lay the golden eggs fly away (as has happened in Italy, France, and the United Kingdom). Maybe we can take up a collection and hire Mr. Leventhal to do a bit of economics tutoring for a certain Nobel laureate? P.S. Just in case you’re not convinced by the experiences of a local politician, there is lots of empirical evidence for the Laffer Curve. Such as this study by economists from the University of Chicago and Federal Reserve. Or this research from the American Enterprise Institute about the Laffer Curve for the corporate income tax. I’m not a big fan of international bureaucracies, particularly the Paris-based Organization for Economic Cooperation and Development. The OECD, funded by American tax dollars, has become infamous for its support of statist pro-Obama policies. The OECD has allied itself with the nutjobs from the so-called Occupy movement to push for bigger government and higher taxes. But I’m a policy wonk, so I’ll admit that I often utilize certain OECD’s statistics. After all, if numbers from a left-wing organization help to advance the cause of liberty, that makes it harder for opponents to counter our arguments. With that being said, let’s look at some truly remarkable statistics from the OECD website on comparative living standards in industrialized nations. This chart shows average levels of individual consumption (AIC) for 31 OECD countries. There are several possible measures of prosperity, including per-capita GDP. All are useful, but AIC is thought to best capture the well-being of a people. 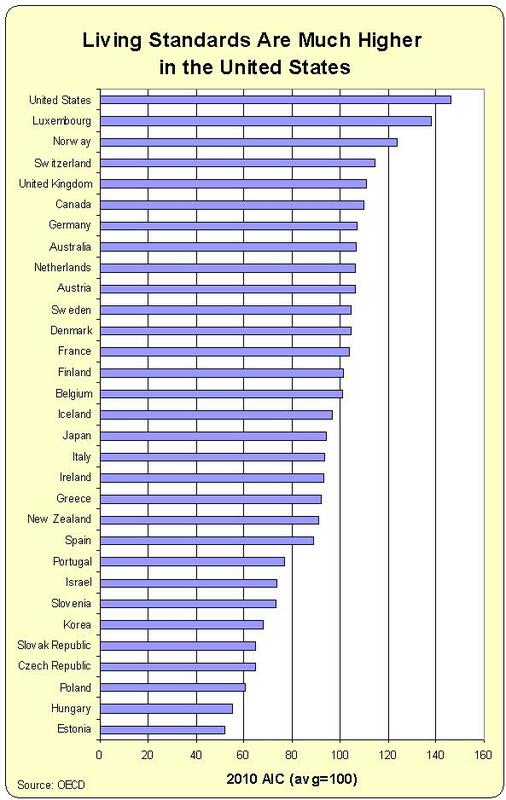 As you can see from this chart, the United States ranks far ahead of other nations. The only countries that are even close are Luxembourg, which is a tiny nation that also serves as a tax haven (a very admirable policy, to be sure), and Norway, which is a special case because of oil wealth. For all intents and purposes, Americans are about 40 percent better off than their European counterparts, in part because we have less government and more economic freedom. Yet Obama, with his plans to exacerbate class-warfare taxation and further expand the burden of government spending, wants America to be more like nations that have lower living standards. 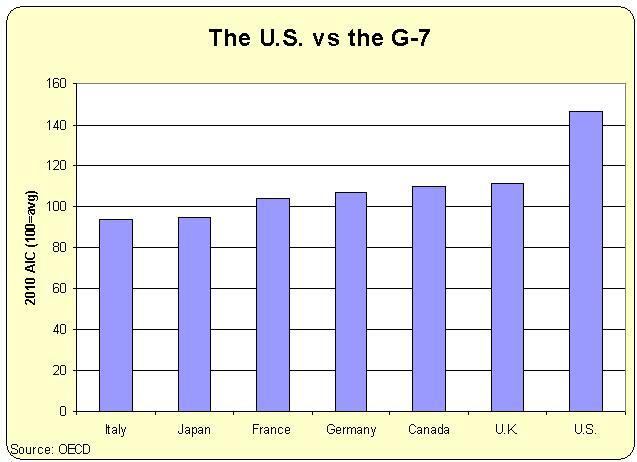 Here’s another chart that looks at the G-7 nations. Once again, the gap between the U.S. and the rest of the world is remarkable. Maybe, just maybe, the United States should try to copy nations that are doing better, not ones that are doing worse. Hong Kong and Singapore come to mind. Getting there is simple. Just reduce the size and scope of government.